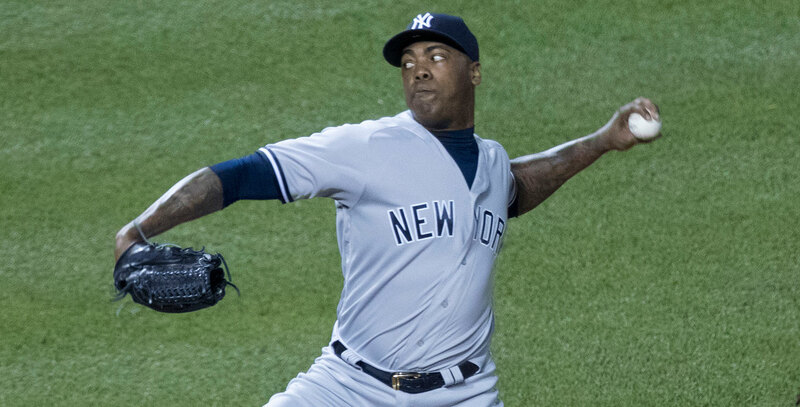 Before the 2017 season, Aroldis Chapman signed a near-record-setting contract to play for the Yankees. The club knew what they were getting, both on and off the field — they had traded Chapman to the Cubs earlier that year, and now they were bringing him back. More broadly, baseball knew what the Yankees were getting — a dominant closer with a dominant fastball. Just how much of an outlier was Chapman’s fastball? Well, when MLB created a fastest pitches leaderboard to show off Statcast, they added a button called the “Chapman filter.” In 2016, Chapman threw the thirty fastest pitches in the majors. It’s not much fun looking at a leaderboard that’s just one guy’s name over and over again. Fast forward a year, and all the signs were trending downward. Chapman put up a 3.22 ERA and a 2.56 FIP in 2017, both the highest marks since his rookie year. He struck out a career-low 32.9% of the batters he faced (which is still pretty good for a career-low). His average fastball velocity declined by a mile an hour. By early 2018, he’d even been dethroned atop the fastest pitch leaderboard by Jordan Hicks. The human brain is an amazing pattern-matching machine, and we’ve seen this one plenty of times. Closers often break — it’s one of the reasons Chapman’s five-year contract was considered a risk when he signed it. The king has his reign, and then he dies. It’s natural. Well, a funny thing happened on the way to irrelevance. Aroldis Chapman reinvented himself in 2018, and while he didn’t quite get back to his game-breaking 2014 highs, he recorded a 2.45 ERA and an even more absurd 2.09 FIP. He struck out 43.9% of the batters he faced, the second-highest rate of his career. How did he do it? Did he reach back a little further and take the velocity lead back from Hicks? Not even close, as his average fastball velocity declined another tick in 2018, and he finished a distant third in that category, the first time he wasn’t the hardest thrower in baseball since 2011. Instead, he leaned on his slider — one that may be the best in the game today. What’s in a slider? How can we say that Chapman has one of the best ones in baseball? Well, it’s certainly more complicated to evaluate a good slider than a good fastball. For the most part, we have a good understanding of what makes fastballs good. It’s the speed; it’s the spin; and it’s the location. If you’re throwing 100 mph on the black with late life, that’s a good pitch. That’s why the fastball leaderboard is such an appealing thing to baseball fans. Sliders aren’t quite like that. The best sliders are deceptive, but that’s not always an easy thing to tease out in data. Faster is mostly better. More spin is mostly better. More movement is mostly better. Still, however, it’s tough to pin down the ideal. Unfair would be a good way to describe it. Hitters mostly can’t get the bat off their shoulders when Chapman throws them a strike. If they do, they still can’t hit it. Maybe it’s a function of hitters gearing up to hit the fastball. Maybe it’s a function of the 14.5-mph difference between his fastball and his slider. Maybe his delivery is just deceptive. Whatever the cause is, if Chapman gets his slider in the strike zone, hitters are more or less helpless. How does Chapman do when batters swing at sliders out of the strike zone? Well, I don’t have another top ten list with him out in front by a mile, as he’s merely 20th out of the 281 pitchers on the list with a 77.8% whiff rate. That’s a lot of swings-and-misses, but it’s not quite off the charts in the same way his in-zone sliders are. He generates marginally fewer swings outside of the strike zone — a 37% swing rate, in the upper 25% of pitchers but not a standout number. Essentially, hitters are just guessing — they swing at 37% of balls and 42% of strikes. That 5% difference is, you guessed it, the best in baseball by a lot, like nearly everything else about Chapman’s slider. Put it all together, and Chapman is generating swinging or looking strikes (not even counting foul balls) on 52.5% of sliders he throws. That’s first in baseball by a mile, with Max Scherzer second at 47.4%. That’s a pretty classic slider profile. The whole idea is to get the hitter to think it’s in the strike zone before it dives low and away. In Chapman’s case, however, it’s a totally different story. Think of it this way: On at-bats that end with a slider thrown in the strike zone, the league hit for a .093 wOBA against Chapman, comfortably below the collective line pitchers produced at the plate last year in the worst year for pitchers hitting ever. 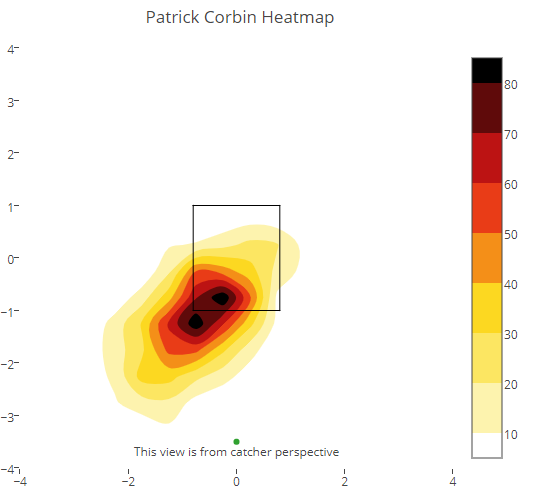 When Corbin ended an at-bat with a slider in the zone, opponents put up a .292 wOBA, roughly the collective batting line of catchers last year. Now, there’s nothing wrong with turning all your opponents into catchers, but it can’t hold a candle to turning all your opponents into light-hitting pitchers. 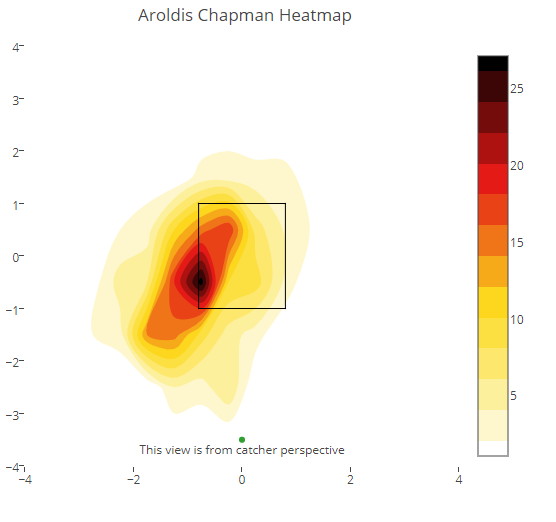 If you’re Aroldis Chapman, why not just throw it in the zone? It looks like Chapman and the Yankees have found something. It’s no secret that New York has been emphasizing sliders (hi Sonny! ), but seeing the results of an already overpowering pitcher adding a second lights-out pitch is impressive to say the least. It almost feels like a gimmick. Throw your slow pitch down the middle? Hitters should tee off. Maybe in 2019 they will. Baseball is a game of adjustments, after all. The first adjustment, however, has been in Chapman’s favor. When he lost 2 mph off of his terror-inducing fastball, you might think the league could finally catch up to him. Instead, he’s innovating and improving, looking better than ever. 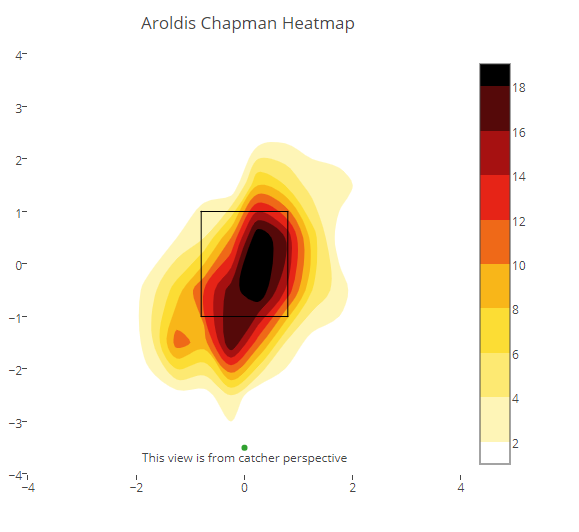 We hoped you liked reading Aroldis Chapman’s Other Best Pitch by Ben Clemens! Ben is a contributor to Fangraphs. A lifelong Cardinals fan, he got his start writing for Viva El Birdos. He can be found on Twitter @_Ben_Clemens. Anecdotally, this spring it looks like Chapman is throwing more sliders than fastballs. Maybe he’s really working on the slider. Also, the fastball velocity has been way down this spring. He seems to be sitting around 97 MPH. I’ve even seen a few under 95 MPH. I wouldn’t worry about his velocity too much. It’s still ST. If it’s still 95-98 in May you might be right to worry. Interesting that we can talk about a guy sitting 95-98 as worrisome. I freaking hate the Yankees.